In my teenage years, my high school had a late start day every Wednesday, wherein school started 1.5 hours later than normal. AKA awesome. Obviously, Wednesdays were my favorite. Bed bums unite! Go to our local donut shop. Devour biscuits and gravy in the car on our way to school. Roll into school with a buddha belly. It’s been awhile since I’ve had a proper plate of biscuits and gravy, but oh how I miss it. 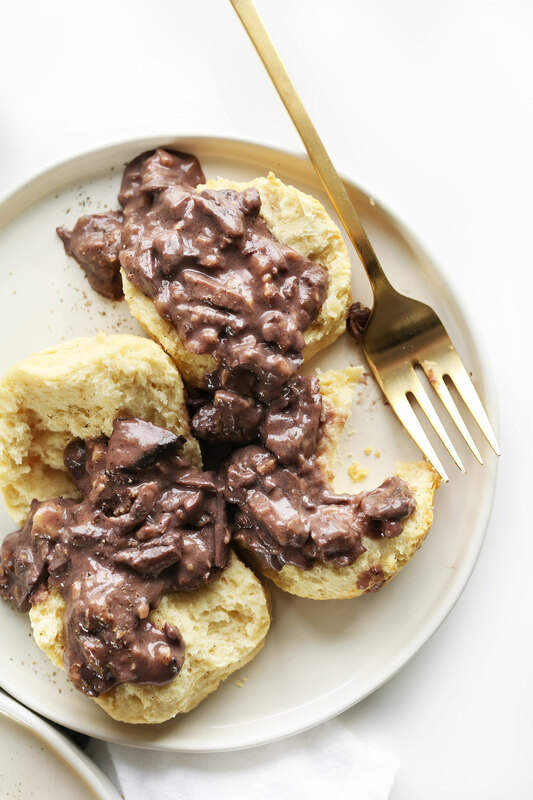 The flaky biscuits slathered in the thick, creamy gravy – swoon. It was due time I tried my hand at a vegan version. This recipe requires just 30 minutes total. 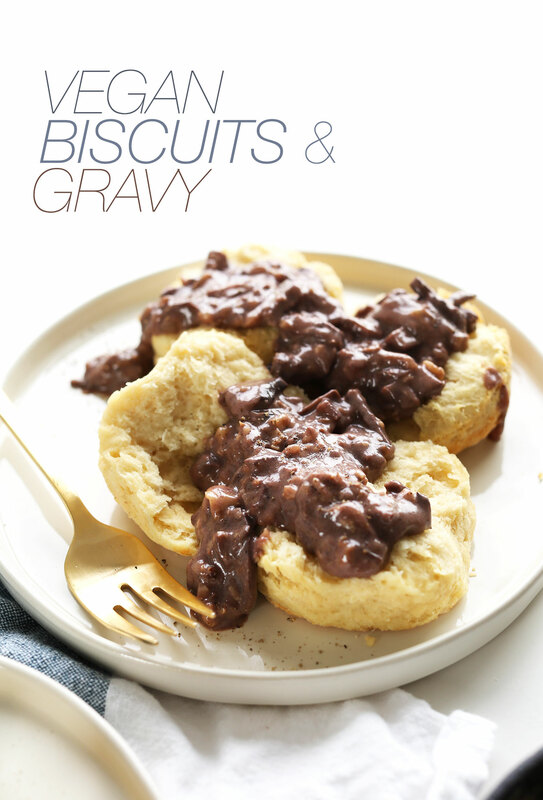 Just whip up your gravy while your biscuits are baking away. 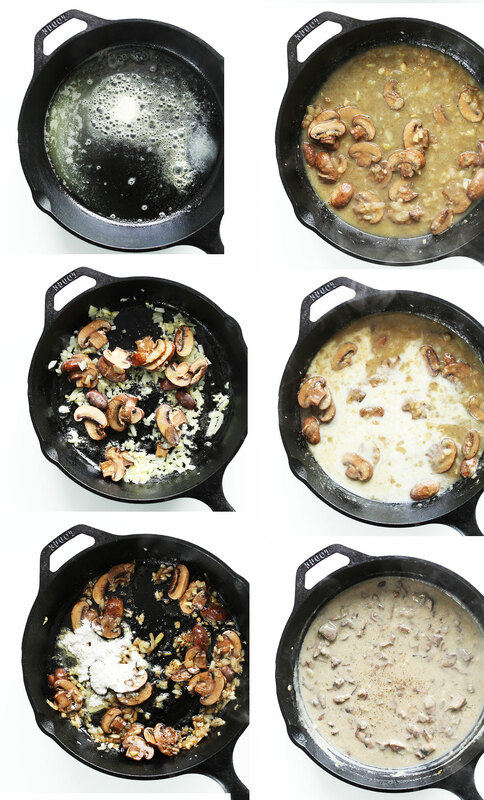 If you’ve never made mushroom gravy, get ready to fall in love. The mushrooms provide a hearty, almost meaty texture and flavor, while the walnuts add extra protein and bite. And, just like my dad taught me, don’t forget a hearty shake of pepper for a bit of heat. Mmm. Just look at that tall stack of goodness just waiting to be covered in gravy. Hello breakfast. This makes the perfect special weekend breakfast, or hearty “breakfast for dinner.” Bonus? If you have leftover biscuits you should totally slather them in vegan butter and jam. Trust me – serious win. If you try this recipe, let us know! Leave a comment and rate it – it’s super helpful! And don’t forget to take a picture and tag it #minimalistbaker on Instagram! We love seeing what you come up with. Cheers, friends! 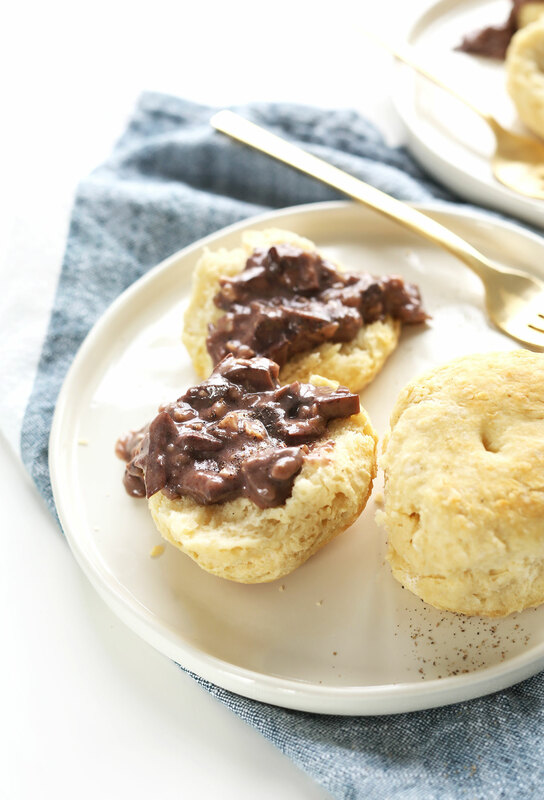 Flaky vegan biscuits with thick, peppery mushroom gravy! A flavorful, healthy, satisfying 30-minute vegan breakfast. 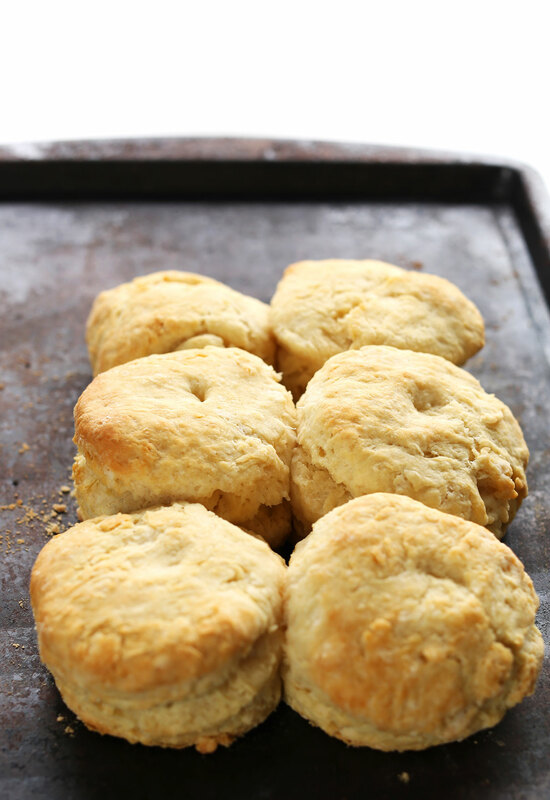 Preheat oven to 450 degrees F (232 C) and prepare biscuits. Add to baking sheet. Place in the oven once you get to step 6 (when adding the walnuts to the gravy). Add butter or olive oil to a cast iron skillet or large saucepan over medium heat. Then add garlic, onion, mushrooms and season with a pinch each salt and pepper. Cook for 3-4 minutes or until the onions are translucent. Add flour and whisk to coat. Cook for 1 minute. Then slowly whisk in broth and almond milk, starting with 1/2 cup almond milk and building up. Season again with a pinch each salt and pepper. Cook until thickened, stirring frequently, over low heat. Taste and adjust seasonings as needed. I go heavy on the pepper out of preference. To serve, split biscuits and top with gravy. Store leftovers separately - store gravy covered in the fridge for up to 3-4 days, and store biscuits (once completely cooled) at room temperature in a tupperwear or plastic bag. Reheat in a 350-degree F (176 C) oven to keep flakiness intact. OMG….so good! I made one small change. I am a mushroom forager ( and a plant based eater) and used my own mushrooms along with green beans sliced in 1″ pieces. I had TRUMPETS and HEN OF THE WOODS already cooked and in my freezer. I pulsed them in my mini food chopper instead of using store bought mushrooms. This recipe was so easy! I also did not make the biscuits. I put the gravy over baked potato. This recipe is a keeper! I made those and found the texture very similar to scones, so enjoyed them as such with cherry jam and vegan butter 👌 Will try (with the remaining) to pair them with gravy, as suggested! This was really quick and easy…my only regret is not making more! Next time I will double the batch. I also am not a fan of having chunks so I will probably chop the mushrooms much smaller next time too and go heavier on the pepper. Someday when I’m feeling fancy I think I’ll add some Gimme Lean sausage to it too! These biscuits are awesome! I made these changes to the recipe: 1. Used coconut oil not butter; 2. half unbleached and half white ww flour. 3. 1 c. coconut milk – way too much liquid for the dry ingredients but I dumped it all in, and then turned the doughy mess onto another cup or so of flour on my counter….carefully folded the flour in, pressed it out, cut it and baked. They were the best biscuits I’ve ever made. Is there anything else I could use instead of mushrooms? I HATE mushrooms. Would ground vegan “beef” crumbles or vegan “sausage” links work instead?? Hi Greyson! We haven’t tried using either of those subs and can’t say for sure how it would work. I would recommend using either green peppers or onion? Can this gravy be made a day or two ahead of time? Delicious! Three out of the six people in my family are vegan, so your recipes have been a huge help. Every single recipe that I have made of yours has been not only well received by myself, my husband and kiddos, but every last drop is devoured…and I usually double the recipes. 😊 Thank You! I have to say, I’ve been vegetarian (and on-and-off vegan) for 12 years now and would consider myself an experienced vegetarian/vegan cook. I’ve bought countless cookbooks, followed endless cooking sites, and have had many veg subscriptions over the years, and your recipes have BY FAR been the best I’ve ever experienced! Everything is so simple and flavorful and easy to make! It’s been such a pleasure following your recipes and making them. Thank you for changing the veg game! <3 I'll keep making your recipes for my meat-eating friends and be sure to credit you wherever I go. We are so glad you’re enjoying our recipes, Brooke! This is my go to vegan gravy recipe and I absolutely love it! Mostly because this uses simple ingredients and not full of vegan butter and vegan shortening, giving up biscuits an gravy was har for me when turning vegan but now my craving is satisfied after making this! I made this! The flavor was pretty good, and the consistency was great. The only critique I have is for the use of mushrooms in this recipe. I personally did not feel that it went well with the expected biscuit and gravy taste. In the future I will omit mushrooms and go for a smooth gravy, or maybe add vegan sausage instead of mushrooms. This was a good reference though! Ummmm… this might only serve 3 cuz I just wiped out at least 2 servings by myself. Oops, haha! ;) Holy smokes it’s delicious!! Thank you SO MUCH for sharing this awesomesauce recipe! Today for the sausage gravy I used Morningstar Farms Patties (cooked on the stove and then ground up), olive oil, the Silk Prebiotic Almond/Cashew/Oat Milk Blend, and several types of ground pepper (Black, Chile, Chipotle), some garlic powder, and smoked paprika. A darker end result, but a nice kick to start the day. Finding your site and recipes has helped me so much with becoming vegan. Im so stoked about vegan biscuits and gravy. Thank youuu!! We are glad to hear it, Todd! So delicious! I added a lot of sage and pepper as well as some vegan beef crumbles to make a “sausage gravy” to put over your vegan/gf biscuits (which are DIVINE). My breakfast is so tasty!!! This is SO good. My Omni husband gobbled it up and absolutely raved about it to anyone that would listen! I made a different recipe for the biscuits, so can’t comment on that, but the mushroom gravy was PERFECT. So comforting and fulfilled exactly the need for the traditional biscuits and sausage gravy. Thanks! Turned out perfect :) nice job! Can you make a recipe for vegan tomato gravy? ? Hi Ashley! I will definitely add it to our recipe request list! Thank you so much! This is my go to Vegan B&G recipe. Love it! Any suggestions for a Gluten-Free version of this mushroom gravy recipe? Would arrowroot powder work as a thickener instead of flour? Hi Morgan! Arrowroot would work! I have frequently used rice flour to thicken sauces. It has the advantage of not creating lumps when added to hot liquids…. takes a little more to thicken than wheat flour does. Another idea (heard it said but have not tried it myself) is to use instant mashed potato flakes. I think this would work beautifully, since potato starch powder can also be used as a thickener. What a great recipe! This was the ultimate comfort food. My first time making biscuits (ever) and they came out fluffy and buttery. We had the vegan biscuits and gravy for Sunday night dinner along with a simple spinach salad and it was perfect. This gravy was honestly even better than the legit turkey gravy I spent an eternity making, I loved it so much. Delicious recipe! 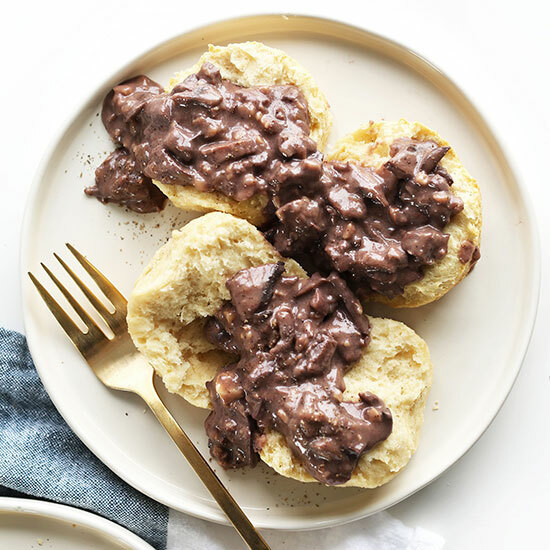 Do you think crumbling your tempeh breakfast sausage (BEST recipe I have found) into this gravy in lieu of mushroom would be worthwhile? I’ve already commented before on the phenomenal vegan biscuits and gravy, but I have to have you know what a FABULOUS recipe this is. Once we finishes what was made, I was strongly encouraged by my guys to make some more and now that’s all gone too! Make this recipe, you won’t be sorry! Those ‘dmn vegan biscuits’ ARE THE BEST EVER. I have made them oodles of times and Every d time they turn out soooo perfect I can barely believe my t-buds could be so thrilled. Might be having a brunch soon and will try with the gravy. Never had a fail yet with Any of your great recipes Dana. Thank you for your efforts to create high standard delish Vegan food. XO! This has got to be the best vegan recipe I have ever tried. I was looking for some comfort food as I had just become vegetarian and I was missing grandma’s cooking. She still cooked it, but I couldn’t eat it :( So then I found your page here and made these for my family. My husband was so happy, his 12 year old cousin gobbled them up. Grandma said they were ok ;-) lol. Thank you for this recipe, I am so grateful and will continue to make this for years to come. Oh my god I made this today! I also added some vegan breakfast sausage to it and it was amazing!!! Great recipe I will use it multiple times! My girlfriend got me your cookbook for christmas and im loving it! I plan on making this recipe in a few days but im going to crumble in tofu and add in a lil cumino and fennel seeds. My soy milk had gone bad so I used 100 ML Of vegan single cream and 1 cup of garlic and herb stock and of my gosh it was amazing!! Has anyone ever tried freezing this gravy? I was considering making this gravy for Thanksgiving and it’s always great to have things that can be made a week before and frozen. 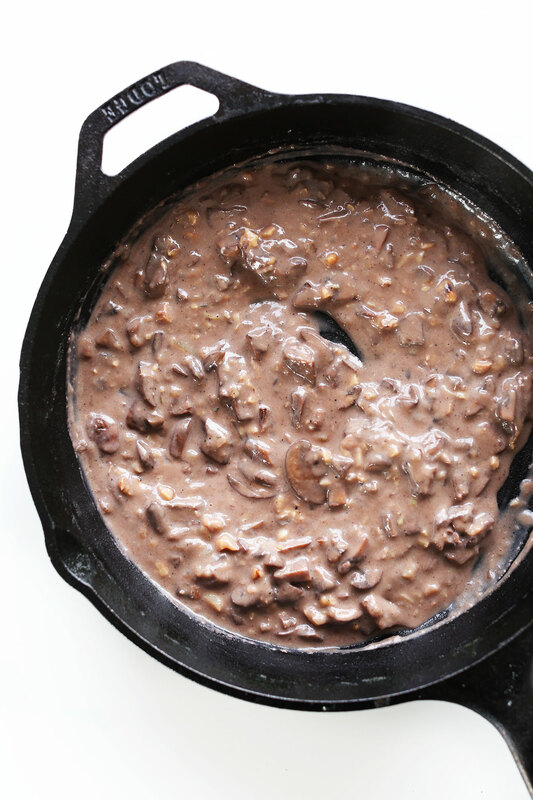 My instinct would be to leave out the walnuts and make it a little thinner so you could thicken it and add the walnuts when reheating but I’d love to hear if anyone has had any success or failures trying to do this or freeze other similar recipes. Just made these for dinner and it was delicious and very filling! 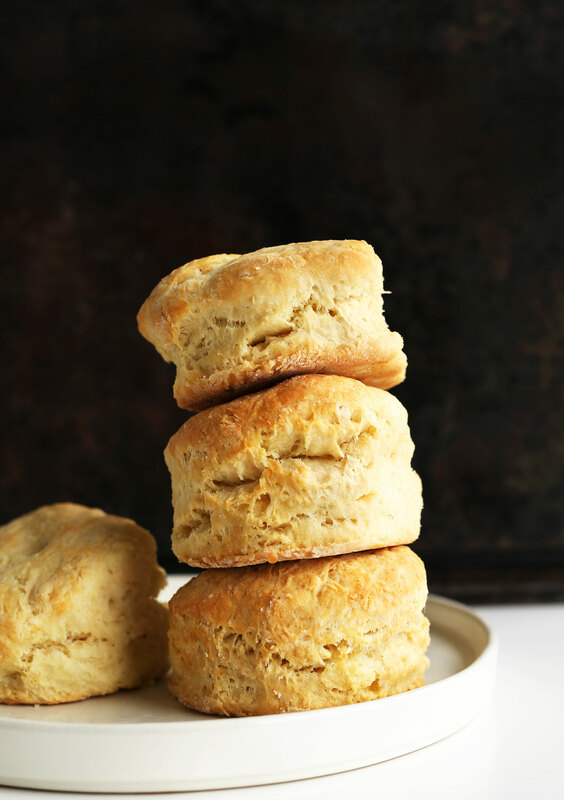 I liked the gravy a lot, and the biscuits were so quick and easy to make…I may even make some more tomorrow morning and add some sage to the biscuits since I don’t want the herbs to go bad and then just eat them with Earth Balance and honey. Just made this for my daughter and her friend for breakfast… They loved it! Great recipe as always ????? Grandma was a hard sale, she has been cooking buscuits and gravy for well over 40 years. But her granddaughter gobbled them down quicker than I’ve ever seen a young one eat veggies! I am currently reading “The China Study” and am looking for great vegan recipes to more easily transition into my new lifestyle. This was amazing! Buscuit butter – I used veggie juice pulp (1 apple, 3-4 celery, 5 carrots, 1 bowl of left over kabob onions/small tomatoes/bell peppers – using a cheep old juicer I purchased at Walmart I had to pick though the pulp and discard to the dogs big chunks of pulp), 2 tablespoons of local honey (30 ml) – still not sure if this is considered vegan as insects create it, 2 table spoons of coconut oil. – there’s is plenty left over after adding 6 tablespoons of this mixture to the buscuits, and I will make bread today. Veggie stock – I went to pick some up at the store but thought again as I refrained from buying vegan butter. This process left me with plenty of veggie juice and all I needed was to add some ingredients like 2 teaspoons of local honey and a bit of water. I put the left over in the frige for the next days creation. This was one of the most satisfying plates of buscuits and gravy I’ve ever had. I have plenty of leftover juice pulp mixture I will use to bake some bread today, and juice to cook some veggies in. Thank you for this recipe, I am extremely lucky to have found it! The gravy would work great on toast. It mor resembles pork gravy than country gravy. You can easily make vegan country gravy (just use vegan milk). So, if you are looking for a more traditional approach, just leave out the mushrooms, garlic, onion, and walnuts. I made this today and it was so good! Definitely will make again and again. My spouse and I agree it is better than our favorite brunch spot’s vegan B&G! The biscuits are amazing on their own. I also liked that the amount of gravy this recipe yielded was just the right amount for the number of biscuits. Both the recipes are quick to make, which is a plus, too. I only had a bag of frozen shiitake mushrooms, so I used those and it worked great. I cooked up some veggie sausage patties, put that on the biscuit, ladeled on the gravy, then topped it with steamed broccoli. Amazing recipe! I had some vegan sausage, which I added while the onions and mushrooms were cooking. The gravy turned out excellent! Loved the biscuits. Thank you so much. New to the whole vegan thing and was really impressed with this. I’m vegan experimenting and have been really enjoying the recipes on your blog. I just made this gravy this morning and served it with your breakfast potatoes. It was so very good. Thanks! Made them and my hubby and two toddlers and I were wishing we made more. Finger lickin’ good. Fluffy and good. I made this for dinner last night which it was a success. My husband was raving about it. The flavors were amazing and super easy to make. This one is definitely a keeper! I just made these, and they were amazing! Busted them out on the first try (never made biscuits or gravy before). Thank you for the recipe! Thanks for the recipe! Great Christmas brunch today! I followed the recipe for both the biscuits and gravy exactly, but replaced non-dairy butter and milk with dairy butter and milk. Awesome results. Thank you for such a keeper recipe. I only used dairy butter coz i ran out of earth balance buttery sticks. I can’t wait to try it with earth balance now so i can make it all vegan the way it is supposed to be. ?? they vanished so quickly i did not get a chance to take photos!! I love every recipe we try from your site. I’m trying to make more breakfast options for husbando besides overnight oats. This is something that would be right up his alley, but I’m allergic to mushrooms and soy….is there another vegetable I could substitute? Hmm, perhaps green pepper or onion? Just made it but substituted cornstarch for flour to make the most delicious gluten free gravy. Love the site and all the recipes, especially the gluten free ones as I am allergic and miss my old comfort foods. Thanks! Amazing! Just made these this morning. Thank you for the great recipes. ? You seriously just rocked my comfort food world! I became vegan a little over two months ago and you are by far the best resource for recipes. I freaking love you guys!! I just made your biscuits and gravy and I feel like my old meat eating self. You are absolutely amazing! Thank you so much for sharing your recipes with the world! ah yay! Thanks for sharing, Danielle! So much love. Glad you liked these!!! I would love to make those biscuits but you didn’t mention HOW much butter or buttermilk….Please add that….. I love vegan food and quite careful what I eat. 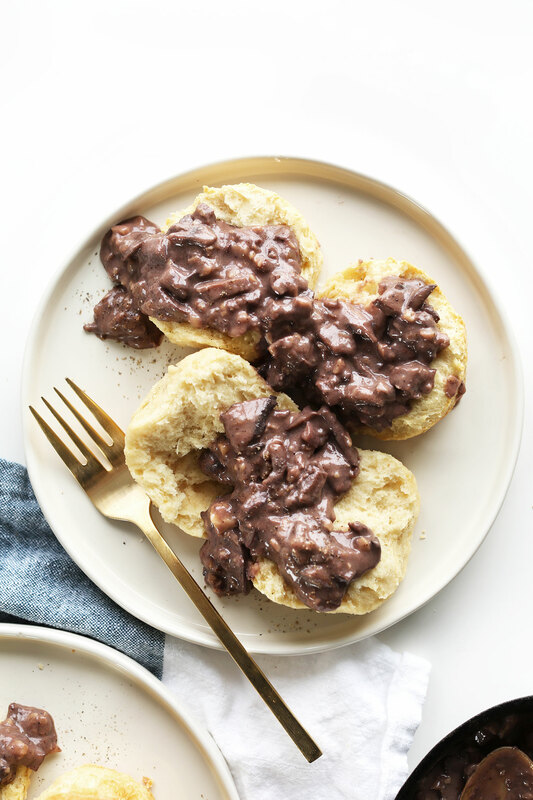 This Vegan Biscuits And Gravy recipe is something that I will be sure to try it. Made these for dinner tonight-with a few substitutions because of what i had in my pantry (whole wheat flour and SoDelicious Coconut drink). It was delicious! You are definitely right on about the pepper! I realized as i was eating it, that it is the pepper that really makes it country gravy for me! Oh wow those look absolutely insane!!! Too good to be true almost – I’m definitely gonna need to try this one. Some people have made my biscuits using a GF flour blend, but I haven’t had much luck yet! Sorry I couldn’t be of more help! I have never thought much about biscuits and gravy. I am vegan now and prefer to stay away from faux meats as much as possible and am always looking for more breakfast options. And in just the last year or so I’ve learned that I have a gluten intolerance/allergy. So it took a little bit but I was able to find a biscuit recipe that worked a big thank you to King Arthur, I used your biscuit secrets and they came out famously. Then I started on your gravy. I doubled it, at first I wasn’t sure if I should but it would give me other options too in case the biscuit thing didn’t work out. I used the fresh herbs I had in my garden and added extra onion and a little more walnuts. I ate two full plates! I am so stuffed! Talk about your buddha belly. :) I have enjoyed many of your vegan and gluten free recipes. Thank you so much Dana I look forward to seeing what else you come up with. Yay! So glad you liked it! Thanks for sharing. We had this for breakfast this morning; easy, delicious, perfect! Thank you so much. This was breakfast this morning. What a nice change from granola. Gravy was fabulous. Had to use someone else’s biscuit recipe since your site went down this morning around 7:30 to 8—-are you aware of this? Was it just my computer? It seemed like other sites were working. I have never left a recipe review before, this is just amazing. I just finished scarfing down 2 whole plates. I am a huge biscuits and gravy snob and this could punch any other recipe in the jaw. So far everything I have tried on your website has been great, it is making my new vegan adventure a lot more fun. Yay! Best compliment. Glad you enjoyed it, Eli! We finish early on Wednesdays. A Wednesday morning breakfast ritual sounds like a much better idea!!! Yay! Thanks for sharing, Jordan! What a coincidence! In college, my dorm cafeteria used to serve biscuits every Wednesday. When my roommate and I moved into an apartment, we still kept the “Biscuit Wednesday” tradition. I’ve fallen out of the routine, but now with this recipe, I might make a comeback! This looks so good, and I love mushroom gravy. I’m not such a fan of chunks of mushroom though- the texture is usually a little too “meaty” for me. Do you think pureeing the gravy as a final step might work? I really want to hear some tips because I can’t wait to make this! Hmm, I’ve never tried that but yes, I think it’d work! Let me know if you give it a try! Another great recipe! I made this for dinner. The gravy is outstanding! I added a pinch of dried sage and dried thyme with the first hit of S&P, since I didn’t have fresh. And the biscuits, always fantastic. I just ran out of lemon, so I used half as much ACV. Just as fluffy and scrumptious as always! Yay! Thanks for sharing, Alison! Total comfort food right here. Yum! I love mushroom gravy. I made a smooth and creamy gravy for Thanksgiving that my family loved. I like how you left the mushrooms in tact instead of straining them out of the gravy. And those biscuits…..
My husband is OBSESSED with biscuits and gravy. It is usually one of the few times I go with a faux meat in order to achieve desired cravability. Until now, perhaps? I make mushroom gravy a good bit but for some reason the thought to throw some flour in it never occurred to me. Consider this made! I will post a pic for you guys when I get around to whipping it up. Thanks for this one! This looks so yummy! I was just wondering if the flour could be substituted for cornstarch or something since I eat gluten free? Yes! I would recommend tapioca starch, arrowroot or cornstarch! Use slightly less than the recommended amount of flour and work your way up! Let me know how it goes! if using cornstarch (not sure about the others), make sure to make a slurry by mixing it with a little cold water before you add it to the pot. Best. Compliment. EVERRRRRR. Thanks Deborah! Hope you give these a try! I could not find the biscuit recipe. It only has the mushroom gravy recipe. Am I downloading it correctly? It’s linked there in the ingredients. Amazingness, Dana! I adore this recipe. Those biscuits! OMG! Oh me gosh, those biscuits are so tall and flaky AND vegan! That just makes me so happy! The mushroom gravy looks like complete perfection, mushrooms are one of my favourite foods at the moment. This sounds amazing! I love the gravy idea! Genius Dana, just genius. :) You never cease to amaze me. This reminds me of another recipe that piqued my curiousity. A local supermarket sells black pepper cashew, which reminded me very much of sausage gravy. Will make this soon. Oh and the pb choco avocado pudding is awesome. Thanks for sharing. this is insane! so good lookin’ and i CANNOT wait to try!